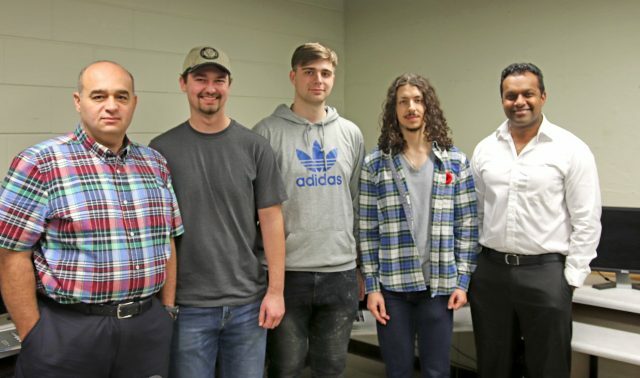 The Brandon University programming team (left to right) of coach Ashraf Abdelbar, Jason Klimack, Andrii Hrytsenko, Logan Praznik and supervisor Gautam Srivastava were the top Manitoba entry in the ACM North Central North America Regional Programming Contest. BRANDON – A group of Computer Science majors became Brandon University’s (BU’s) first team to top all Manitoba entries in the ACM North Central North America Regional Programming Contest last weekend. On Saturday, Nov. 3, the BU team of Logan Praznik, Jason Klimack and Andrii Hrytsenko took part in the regional competition of the International Collegiate Programming Contest (ICPC) in Winnipeg, one of 12 regional sites where the event was simultaneously staged. Competing on site with several teams from the University of Manitoba and the University of Winnipeg, Praznik, Klimack and Hrytsenko posted the top score at the location — a first in BU’s six years of competition. Overall, the BU team placed 23rd out of nearly 300 competing entries representing universities in eight central U.S. states as well as Manitoba. “It’s rewarding to see that you can compete with other big universities and you can win,” said Hrytsenko, who is a graduate of Vincent Massey High School in Brandon, while Praznik and Klimack are both alumni of Crocus Plains Regional Secondary School in Brandon. The students are given a list of 10 problems and are tasked with solving as many as they can in five hours, working in a team of three but with only one computer. That means they will tackle some elements of the problems together, while working out other parts on paper on their own. The BU team was the only one in Manitoba to solve five of the problems. Across the region only 16 teams solved more than five problems, and two problems were not solved by any team at any site. “The test isn’t designed to be completely solved,” said Dr. Ashraf Abdelbar, a Professor of Mathematics and Computer Science at BU and the team’s coach. The BU team, which was supervised at the competition by Dr. Gautam Srivastava, an Associate Professor in the Department of Mathematics and Computer Science, has had plenty of experience to develop their strategy and teamwork. This year’s competition was their third working together as a team. Abdelbar has taken teams to the competition for more than 15 years, predating his arrival at BU. To help develop skills in local students he organizes a high school programming competition each year as well as training at BU that begins each fall. The programming contest began in Texas in the 1970s and has grown to involve more than 50,000 students from six continents. After the regional results are tabulated, more than 120 teams will be invited to take part in the 2019 World Finals next spring at the University of Porto, in Portugal.